Hi everyone! It’s Jon Richardson your Game of Crowns recapper for this season which has sadly come to an end. But lucky for you we are going out with a bang! 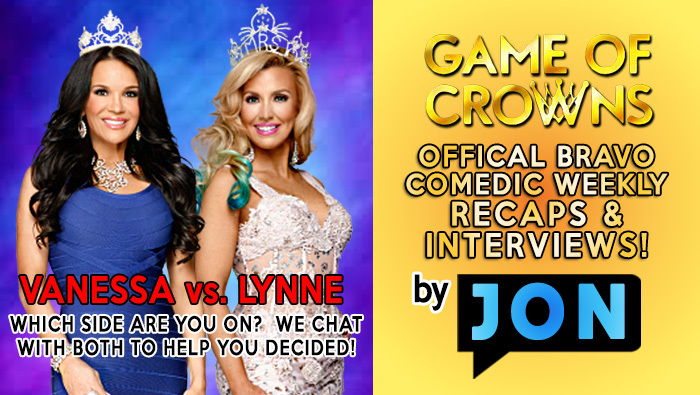 As you know we are one of the OFFICIAL BRAVO SITES bringing you EXCLUSIVE “Game Of Crowns” content all season long! And on this finale recap and I am joined by Vanessa Sebastian AND Lynne Diamante! That’s right, so we need you to weigh in… whose side are you on?! YOU WILL ONLY BE ABLE TO SEE THESE RECAPS ON OUR WEBSITE BECAUSE THEY ARE EXCLUSIVE BABY! If you missed the show its a great way to catch up before next weeks show! If you’ve already seen it, then come laugh along with me! Make sure you follow me on twitter because I’m live tweeting the show west coast time every Sunday! If you want EVEN more content from MANY other Bravo shows then check out our BRAVO PAGE for vlogs, blogs, comedic recap shows and the bravo blogs of the housewives read to you! Also if you are listening in iTunes or Sticher (when we do our interviews or shows) please do us a favor and leave us a nice review and 5 stars. If you’re watching on YouTube give us a thumbs up and nice review (you can do that from any player around here without even leaving the website). Those things really help! Of course you can always make a donation via pay pal or become a patreon to get exclusive content and help support our shows. You can also start your online shopping by clicking on the Amazon ad in the side bar. You pay no more money and they continue to sponsor us. It’s thanks to your support and donations that we can keep providing you with all the content weekly and we are so grateful for your support. But ok, what are you waiting for? Let me know what you think in the comments section below. Are we team Vanessa or Lynne?